I went out on friday and got 5 ducks with my dad. I got one that day, (my first duck ever!) The next day we only got one duck and I shot that one too! What kind of duck did you get? It has been kind of sparce here in CO. We have managed to hit all the warm weekends and the birds are nowhere to be seen. Next weekend it is supposed to be a bit cooler and we're hoping to see some geese in the mix. Well here in Phx, Az the hunting is not very good. We are just shooting alot of locals that are very educated and wont decoy in or come in range. how they got so good at duck hunting. Look out Kentucky and Tennesse! This past Thursday I easily saw a thousand mallards flying south with a stiff tailwind. Not a one wanted to stop and rest in front of me or anyone else on the state reservoir I was hunting. 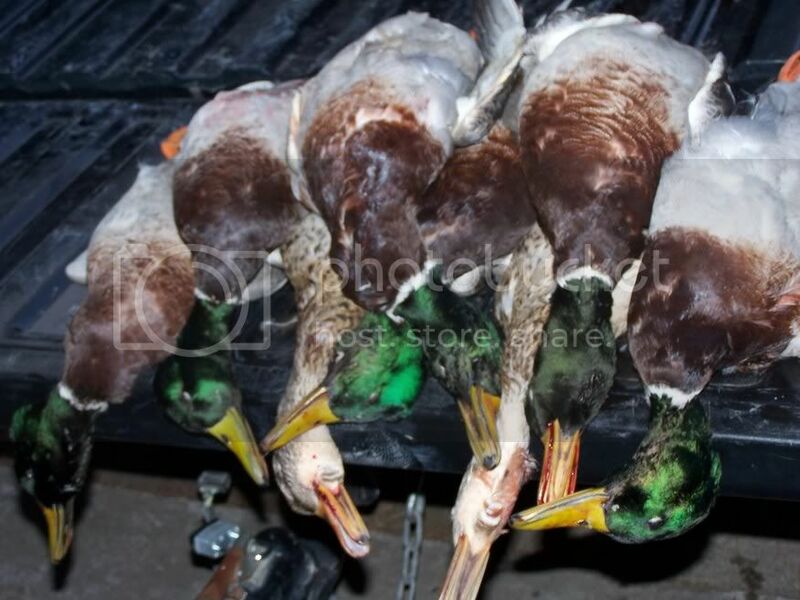 Friday, different story, saw 8 mallards all day. From two days ago, Sat morning until about 9:45 and full limits...wow was this fun... You could say it was a full blown "Bush Whacken"
Shooting in my area has been good on woodies and teal so far.. spoonies have been a little more plentiful and I've noticed an increase in my respective area in pintails and canvasbacks. Canadian's have been overly plentiful.. only 1 a day bag here and it'll be strong until season's end. When we were hunting we were sorrunded by birds to the left of us and in front of us. We easily saw around 1500 birds flying around and teasing us. 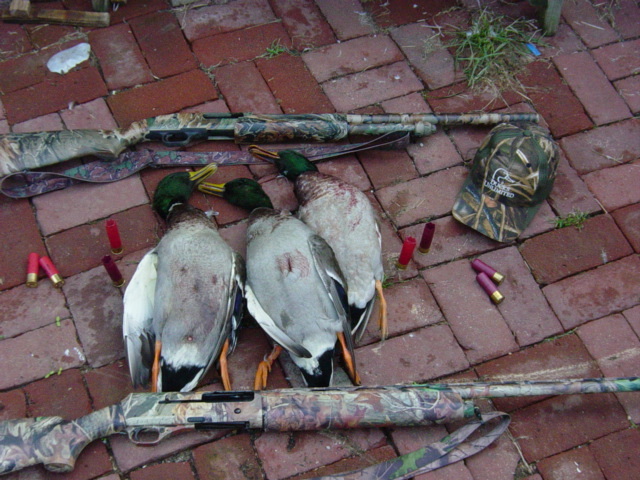 We shoot at an amazing duck hunting club! Thank you and yes I read all the info I can on duck/goose hunting. My son saw a picture me and my buddies took of a grouse hunt with the guns. So when we finally got some ducks he wanted to take the same type picture. So my 12 year old set that picture up, turned out great. Looks like you shot yourself a nice bag limit of cool ducks. Most of the ones around here are mallards, saw a couple shovlers they other day no shooting though. 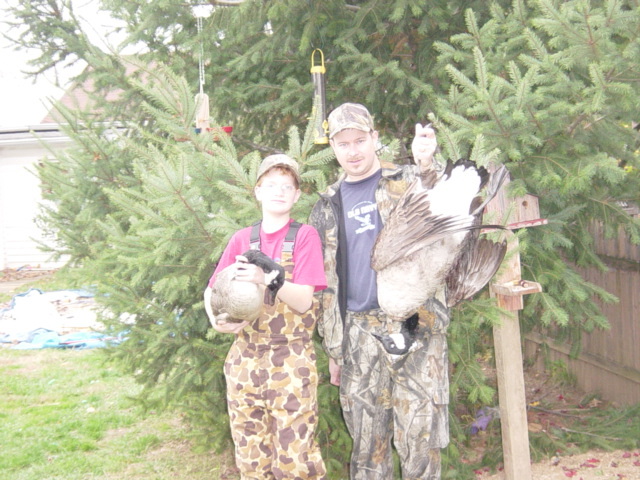 Here is a pair of honkers we got the first day, took his to get mounted his first one. 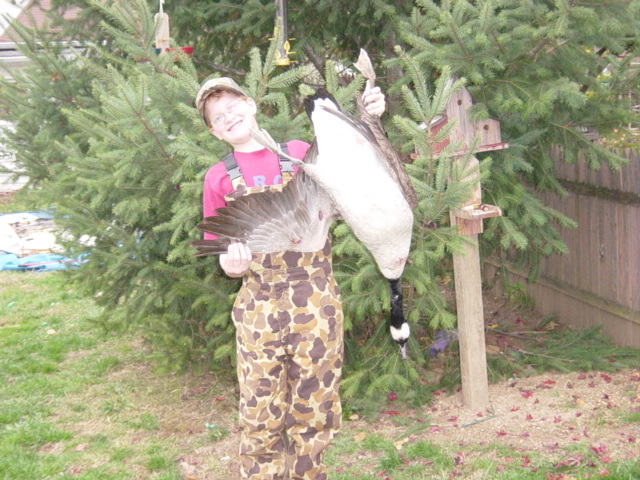 His weighed 11 1/2 and mine was 12 1/2 pounds, biggest geese I have ever shot. I just got back from Idaho. We kill the S*it out of them. 64 in three days. It was hard to leave the blind each day as the the ducks continued rained down on us as we picked up the decoys. Southeast Idaho is really rockin! 92 ducks in the last 5 trips. 88 of them mallards. Close to 300 now for the season. 5 bands in my group too. Just an amazing winter here and it's all on wide open public land. 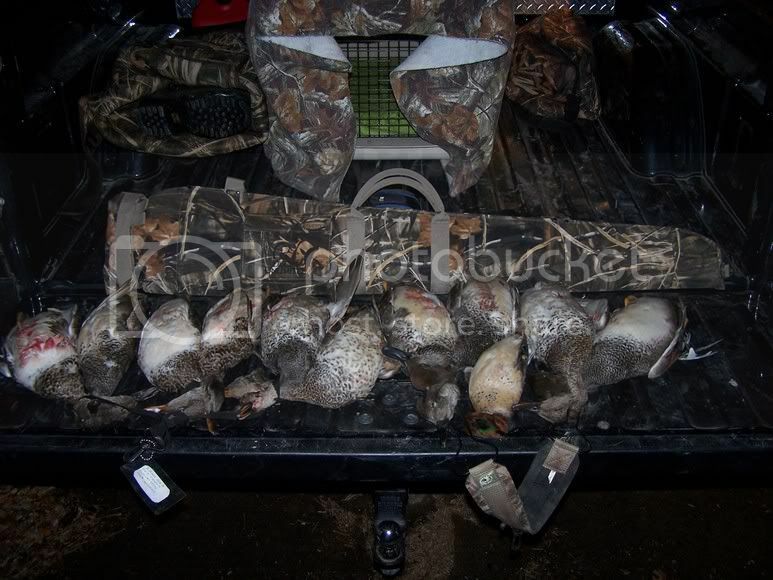 Here are a couple recent hunts. Just getting warmed up here in Cali. We hunt hard in January. I'll get out 20 or so days from here to the close. Hitting the southern shores of Lake Erie this weekend. If we don't get our limit of birds we will definitely exceed our limit of Great Lakes Brewing Company's finest! At least someone's getting some quality trigger time in. Is that a cinnamon teal on the end in the first pic? My season ends this weekend. Yes. My club has a resident group that lives there. We shoot a few. They don't generally decoy well. Thank gawd for a January 29 close - January is our best month usually. Are those rice fields? I never realized Ca had such quality waterfowl hunting.